The Afrikaner Republics were independent states established in the 1850s by Dutch colonists (Afrikaners) from British-ruled SOUTH AFRICA. 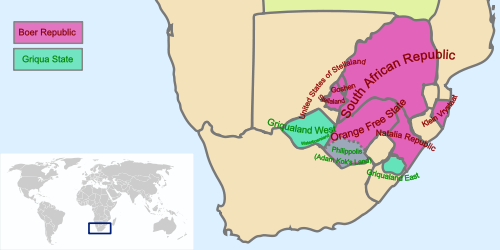 The two longest-lived of the Afrikaner Republics were the Orange Free State, located between the Orange and Vaal Rivers, and the South African Republic (or Transvaal), between the Limpopo and Vaal Rivers. Each state had a strong central government, a judicial system with limited powers, and voting rights restricted to adult white males. The black Africans who lived in these states had no civil liberties or rights of citizenship. Troubled by conflicts with surrounding African communities and a weak economy, the Orange Free State was unstable. The economic situation improved dramatically when diamonds were discovered there in 1867. Although the Orange Free State lost ownership of some of its diamond fields four years later, its economy became more stable. Moreover, it increased its territory by conquering several small African states. The South African Republic also experienced political turmoil as it tried to expand beyond its borders. In addition, the country was torn by infighting between Afrikaner groups. In 1877 the British declared the South African Republic a part of their colony in South Africa. The Afrikaners resisted the takeover, defeating the British army in the First War of Independence in 1881.